Aggregate Data: configure your own UberCalc jobs to take the sum, min, max, average our count from a filterable set of child objects (e.g. the number of open high priority issues on each project), compute the value at a cadence of your choosing (e.g. nightly), and then store the result in a custom data parameter on a target parent object (e.g. right on the project), making it available (and easy) to then use with native Workfront reports, views, groups, filters, and calculations. The possibilities are endless, and the results are liberating. Custom Workflow: with a bit of our help, you can effectively extend Workfront’s data model by providing a custom tab on new request for users to enter an important reference number (e.g. Charge Line Codes) that then validates their entries against the latest data (e.g. an Excel file from your Accounting System you upload as a document each morning, and once validated, displays a template dropdown they can select from to then convert the (now validated) issue into a project, transferring the issue’s custom data, documents, and notes automatically as it does so. 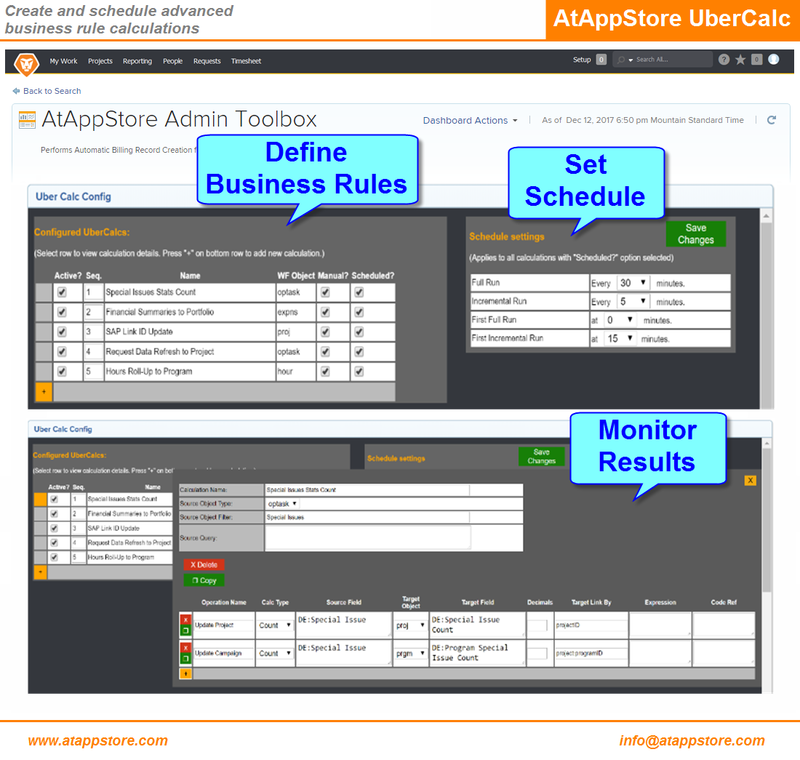 Commit Date: each night, UberCalc can automatically overwrite (sometimes inadvertent) user entered task commit dates with (more official) planned completion dates, reducing confusion by ensuring both users and project managers are aware of any scheduling changes. Your first year’s annual license of our Estimate solution includes up to four hours for installation and training. If you’d like us to tailor it to suit your needs exactly, we’d be happy to discuss a fixed quote to do so.